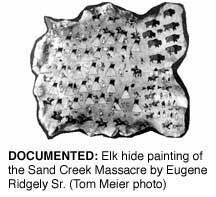 Elk hide painting of Sand Creek Massacre by Eugene Ridgely Sr. In 1864 in southeastern Colorado, more than 150 Cheyenne and Arapaho tribe members, mostly women, children and elderly people, were killed in an unprovoked attack led by Colonel John Chivington. Although the U.S. government quickly denounced Chivington's actions as a national disgrace, no memorial distinguishes the site from its surroundings. More than a century later, Sen. Ben Nighthorse Campbell, R-Colo., has proposed legislation to make the Sand Creek Massacre a national historic site. "(Sand Creek) is clearly a nationally significant event," says Rick Frost of the National Park Service. "It triggered a long Plains war and was a seminal event in the history of Western expansion." With the help of the Northern and Southern Arapaho and Cheyenne tribes, the Park Service located the massacre site and recommended management strategies for its future. Steve Brady, president of the Sand Creek Descendants of the Northern Cheyenne, says the massacre symbolizes the long periods of forced assimilation tribes have endured. "(Chivington) was riding into the village with a Bible in one hand and a sword in the other, in the name of God and country," he says. Brady says the land belongs to the tribes under the 1851 Fort Laramie and the 1861 Fort Wise treaties, although today the entire 12,480 acres of the massacre site are privately owned. At this point, only a central 1,500-acre plot is up for sale. James Doyle, communications director for Campbell, says the proposed legislation will first preserve the core 1,500 acres as a national monument, and leave room to add more land if sellers become willing. Campbell hopes to push the bill through before the end of this session.